The early maps of Pennsylvania show that the area of land now called Middletown was “A Susquehannock Indian Town” (1715). When Middletown was laid out in 1755, some lodges of the Conoy or Ganawese Indians were located on the ground in the area bounded by Pine, Spruce, Main, and High Streets. These two tribes were “remnants” of the once-powerful Susquehannock Nation. The Scotch-Irish were the first white settlers of this area. Not Irish by blood, but Scotch religionists of rigid Presbyterian faith who were compelled to leave Scotland or be prosecuted. These people migrated to Ireland, but as they did not want their children to be under the Irish Catholic influence for too long a time, they soon migrated to America. Near the mouth of the Swatara Creek, a rough Irishman named “Anderson” claimed 423 acres on the Susquehanna River. This claim dates back at least to 1728. Jacob Job, a Philadelphia merchant, acquired the rights to the Anderson claim in 1732. It has been estimated that by 1750 there were about 200 Scotch-Irish families in the vicinity of Middletown, which was then in Paxtang Township of Lancaster County. Jeremiah Job was the first English settler of record of lands composing what is now the town. His home was a long two-story log house located on the northwest corner of Main and Pine Streets. We know little about the English settlers except the Fishers. We do know that William Penn visited the land at the mouth of the Swatara Creek and Susquehanna River in 1683 while on his journey “to the interior”. On January 27, 1759, John Fisher and his wife, Grace, granted unto their youngest son, George Fisher, tracts of land which totaled 691 acres and 53 perches, plus allowances. It is apparent from this record that George Fisher came here before the actual conveyance of lands to him, as the date of laying out Middletown is given as 1755. 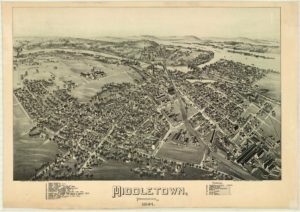 Middletown, the oldest town in Dauphin County, was laid out thirty years before Harrisburg and seven years before Hummelstown. Due to its location for trade, both by land and by water, the town grew rapidly for at least a century and a half. Prior to 1729, this area was a part of Chester County. In 1729, Lancaster County was formed, and on March 4, 1785, Dauphin County was formed. Middletown was a “Post Town” and so named because of its location midway between Lancaster and Carlisle, along the old Stage Coach Road laid out in 1736. German immigrants began to filter into the area in the 18th century from the Palatinate and Black Forest regions of Europe and the Dutch from the “low country”. They came by way of Switzerland, Holland, and England. A few of these families came to Middletown, but most settled east of the Swatara Creek because of the Scotch-Irish influence in Paxtang Township. Middletown is noted in colonial records as being a supply depot for the Revolutionary Armies. Many small boats for General Sullivan’s army were built here and his troops were supplied with provisions from local farms. The Swatara Ferry House (Old Fort) is reported to have housed Hessian prisoners during the Revolution. On June 10, 1774, the residents of Middletown published their “Resolves of Independence” from Great Britain at a meeting chaired by Colonel James Burd. These ideas thus presented became, in later years, incorporated in the colonies’ “Declaration of Independence”. After the Revolutionary War, many of the Scotch-Irish did not return, or if they did, left shortly thereafter for new homes in the West. It was then that our town experienced its greatest immigration of the German element. Volunteers from Middletown were in the Whiskey Rebellion of 1794, the Mexican American War of 1846, the Civil War from 1861-1865, the Spanish American War of 1898 and all later wars. Camp Meade, west of town, was a troop garrison during the Spanish American War and Olmsted Air Force Base was located nearby from 1914 to 1964. After the Revolutionary War, both land and water trade revived and flourished until 1796. After that time the river trade gradually declined because of the coming of the “arks” which could safely navigate through the rapids downstream. Trade again grew when the Union and Pennsylvania Canals were completed in the 1820’s. The town was an important trading center for lumber, domestic produce, grain, milling products and steel implements. George Everhart (Frey), a poor German employed by George Fisher, and later a peddler, became one of the town’s most prominent citizens. He accumulated large acreages of land and eventually founded the Emaus Orphan House. In 1809, George Fisher, son of the founder of Middletown, laid out a second town at the mouth of the Swatara Creek, naming it Harborton. By 1814, the name was changed from Harborton to Portsmouth. The Union Canal, the Pennsylvania Canal and the Harrisburg-Lancaster Railroads all intersected in Portsmouth. There was one small and one very large boat basin to accommodate canal traffic. There were two blast furnaces, one foundry, two extensive flouring mills, and three saw mills, all propelled by waters of the Swatara. A ferry ran from York County to the eastern bank of the Susquehanna. On March 17, 1814, George Fisher and wife conveyed to John Swar of Lancaster County, “that portion of a tract of 220 acres on which the town of Portsmouth is laid off”. John Swar and Anna, his wife, then deeded the lots to other parties. 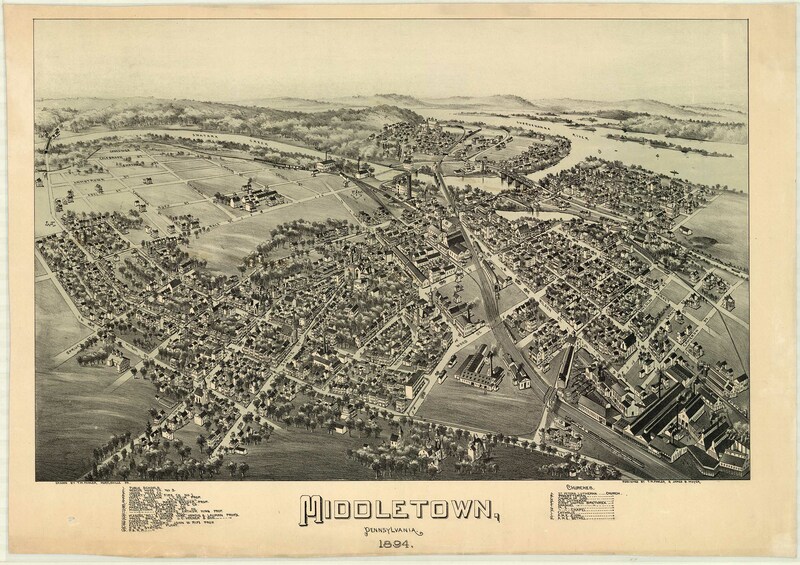 In 1857, the town of Portsmouth, the acreage between, and the town of Middletown were merged into one large town of Middletown.